At the end of our cruise, we decided to spend two (2) extra nights in Copenhagen. Our hotel, the Radisson Blu Royal was very nice and was in a perfect location, across the street from Tivoli Gardens and one block from City Hall Square. 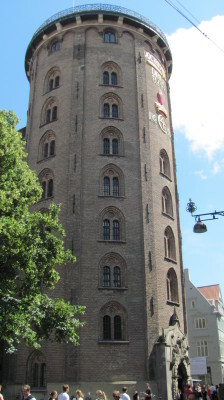 We arrived at the Radisson at about noon, unpacked and headed out to walk Copenhagen. 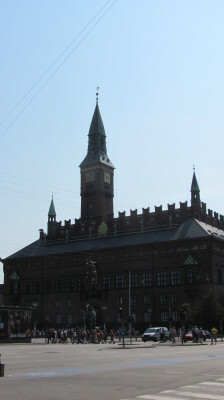 We began at the impressive City Hall. Unfortunately, the building is only open for organized tours on Saturdays and is not open on Sundays. Thus, we were unable to see the interior. We did find a popular statue of Hans Christian Andersen, of fairy tale fame, on the edge of City Hall Square. From here we walked to the Copenhagen Cathedral. Again, we were unable to enter since a service was in progress. Next we saw the Round Tower, an impressive edifice. 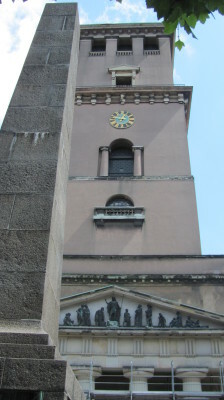 Peter the Great is rumored to have ridden up the tower on horseback. 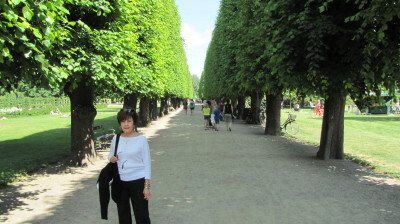 Nearby is the King’s Garden, now a popular public park. 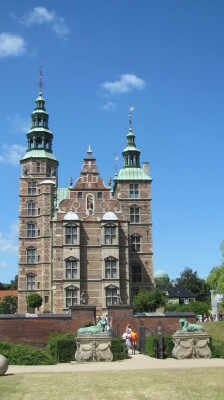 The garden is associated with a former royal palace known as Rosenborg Castle. 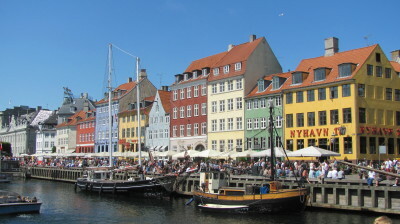 From the castle, we headed for Nyhavn (New Harbor), once a seedy red-light district frequented by sailors on leave. It is now the most popular section of the city, with a plethora of cafes and restaurants along the picturesque canal. This is the classic postcard picture of Copenhagen, and rightly so. The area is beautiful and always crowded with locals and tourists alike. After a bite to eat we headed down the canal to the harbor where we found a great view of the New Opera House. 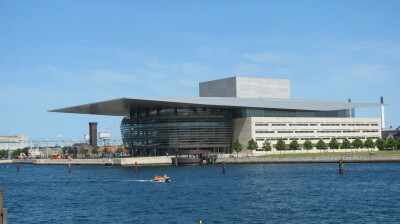 Residents are extremely proud of this recent addition to the Copenhagen landscape. 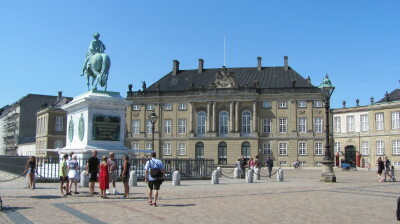 A bit inland is Amalienborg Palace, the current residence of the Danish Royal Family. 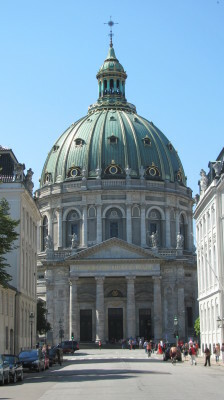 The cluster of buildings that make up the palace have at their center a statue of King Frederick V.
Nearby is Frederick’s Church, more frequently called the Marble Church. 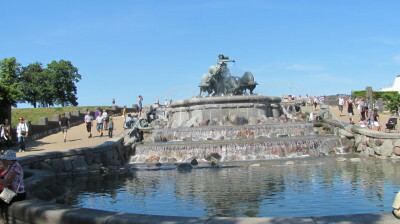 On our way to The Little Mermaid Statue, symbol of the city, we passed the largest fountain in Copenhagen, the Gefion Fountain, whose legendary tale explains the origin of the island (Zealand) on which Copenhagen sits. 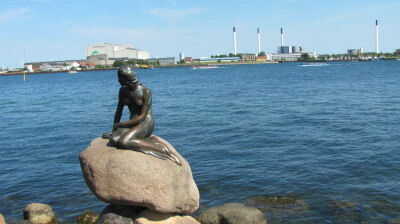 Just beyond here is the Little Mermaid, a Hans Christian Andersen tragic heroine who is inevitably associated with Copenhagen. She was created in 1913 and, although rather small, she attracts throngs of visitors. From here, we walked back to our hotel and crashed. The walk was much longer than we expected. 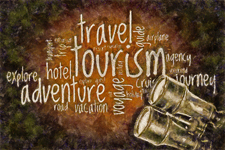 This entry was posted in Photo Albums, Trips and tagged European Travel, World Travel. Bookmark the permalink.